Dogs that come back when called can be let of the lead to run and explore. As a consequence, they are often more content at home and nicer to live with. Teaching your dog to always come when called could save his life and will make your lives together much more enjoyable. Dogs fail to return when called for three reasons. They don’t know what the cue means, they would rather do something else, or they are afraid of the consequences when they return. Watching while your dog runs circles around you or disappears into the horizon can leave you feeling helpless, frustrated and really mad. It’s tempting, when you finally get your hands on your dog, to punish. Since dogs live and learn in the moment, punishing your dog at this critical point can ensure that he avoids you next time, particularly when he see you are cross. Instead, ask him to do something you know he can do, such as sit, lie down, or do a trick, and then praise him for that instead. Seeing him do as he is asked will help to take the sting out of the frustration you feel, and you can lead him away on a positive note which he will remember next time you ask him to come back. Never ask your dog to come to you when you want to do something he dislikes, such as having a bath. Go and fetch him instead. The secret to successful recalls is to find something that your dog likes above all else. This can be a tasty treat or sometimes a good game with a toy. If your dog doesn’t know how to play with toys, you may need to teach this first – go to ‘How To Teach Your Dog To Play With Toys’ or ‘How To Teach Your Puppy To Play With Toys’ if under 6 months of age. Just like us, dogs get bored with things they can have all the time, so keep the treats or game ‘special’ by only giving them for recalls (go to ‘How To Make Toys Valuable’. Vary the food or game from time to time to keep your dog interested. Be fun and exciting too as this will encourage your dog to want to be with you. Ask an assistant to hold your dog by the collar and show him you have food. Move a short distance away and call your dog enthusiastically, opening your arms and crouching down to invite your dog to come to you. Ask your assistant to let go of his collar as soon as you call. As your dog runs to you, hold the food out and lure him towards you. Hold the food at your dog’s nose height and bring him towards you. Hold the other hand lower so that as he moves towards you, you can take hold of his collar underneath his chin. When your dog gets to you, hold his collar, feed the food, then praise him warmly and enthusiastically for a while so that he learns to enjoy being with you and will come to you again next time. Repeat every day, several times a day, for a week. Eventually, you won’t need to use an assistant to hold him, or show him the food first, but just call him from where he is resting. Eventually, once your dog is coming to you every time you call, progress over several sessions to calling when your dog is just out of sight. Aim for success and try to only call him when there is a reasonable chance that he will respond immediately so that he gets into good habits. ALWAYS reward him when he comes back when you call. Don’t call too often once he knows what to do. Call only when you have something worthwhile for him to come for. Always hold your dog’s collar when he comes to you before you feed the treat. This will avoid you grabbing at him as he runs past and having him learn to avoid you because he does not want to be held. Try to always use the same tone of voice when you call so it becomes a sound he can recognize. Try to keep the call consistent in tone and volume. Try to remember this sound when you call in an emergency as this is the voice cue you have trained your dog to come back to. If you usually call in a happy, sing-song voice, and then call in a deep or angry voice because he is heading for the road or quarrelling with another dog, he may take no notice of you because he doesn’t recognise the cue. Once you’ve taught your dog what the cue means, your job isn’t over. In fact, you have only just started. Now you need to teach him to return to you when (i) he is distracted and thinking about something else, and also (ii) he would rather be doing something else. 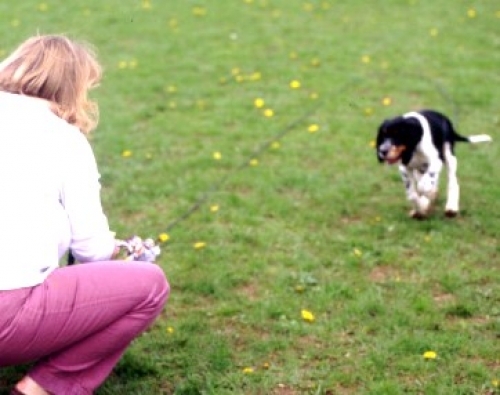 Begin with calling your dog when he is distracted and doing something else. Wait until he is really interested in a scent or doing something else that isn’t too exciting, then call, moving away from your dog and putting lots of energy into getting him to return. Reward really well when he does so. Repeat until he will leave whatever he is doing readily and come to you to earn his reward. Make sure you make coming to you worthwhile so he is really keen to do so next time. Once your dog is coming back when he is busy doing something else, teach him to come even when he would rather be doing something else. For this you will need something that he enjoys doing very much, such as playing with a toy or another dog. You will need to set up a situation so that, once you call, whatever your dog was enjoying stops until he comes to you, and start again only when he returns after having gone back to you first. For example, ask an assistant to play an exciting game with your dog. Call loudly to interrupt the play. As soon as your assistant hears you call, they should remove the toy and hide it behind their back. Wait until your dog comes to you (you may need to call him again once he is less focused on the toy), then praise him well and feed a tasty treat. Then let him go back to play again so that he learns that coming to you is just an interlude rather than the end of his game. After a few sessions, your dog will learn that once he hears you call, the game is over until he has run to you and so he will begin to leave the game as soon as you call. Make sure you have really high value treats for this exercise as leaving something as exciting as a game needs to be rewarded really well. 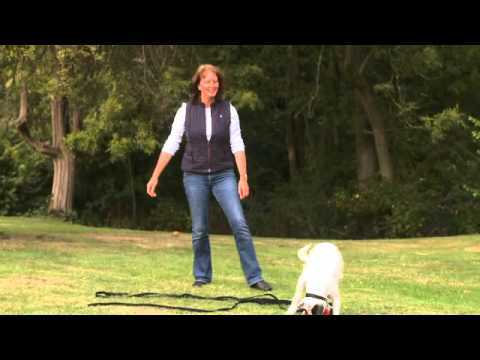 Practice this exercise at home, then in the garden and on walks until your dog is really good at it and is coming as soon as you call. If you are struggling to make this work, lower the excitement level during the games and find better treats. Some dogs may prefer a more exciting game instead as a reward for coming when called. Once your dog is reliable, practice in other situations where he is doing something he enjoys. Remember to call in the same exciting tone you usually use, be as exciting and active as possible to encourage him to come to you, reward him well, then let him go back to what he was doing. To increase the chances of success at first, wait a little while to make sure your dog is a little bored before you call and gradually work up to calling your dog away during more exciting moments. Before your dog is trained, only allow him off lead in places where he is safe.